Director David Yates, a veteran of the Harry Potter film series (including the upcoming spin-off Fantastic Beasts and Where to Find Them), is the latest to tackle the Lord Greystoke. The Legend of Tarzan boasts A-list special effects and kinetic action sequences, but suffers from a muddled, partially non-linear structure. 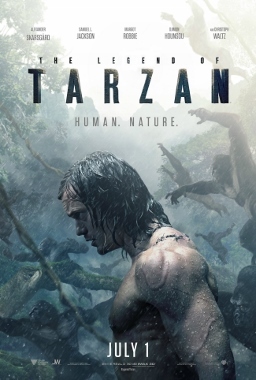 In fact, this telling of the Tarzan tale feels more like a sequel to a movie we never saw. Aside from a handful of flashback sequences, we see very little of the fabled ape man’s back story. Rather than focus on Tarzan (Alexander Skarsgård) and his formative years in the jungle, The Legend centers on political machinations between Belgium and the U.K. over control of the struggling Congo. Christoph Waltz is typecast as a slimy villainous type, the real-life Belgian soldier Léon Rom. Jane (Margot Robbie) is even kidnapped by Rom at one point, held captive. Rom’s real goal is to deliver Tarzan to Congo leader Chief Mbonga (Djimon Hounsou). Meanwhile, the ape man teams up with another real-life figure, Washington Williams (Samuel L. Jackson). Williams knows the Belgians are up to no good in the Congo; they’re deeply embroiled in a slave trade. Action scenes abound, including the site of Washington Williams operating a gigantic machine gun. Samuel L. Jackson appears to be having fun, playing Williams in anachronistic fashion as if he’d escaped from the set of a Tarantino film. But the mixture of history and hysteria doesn’t gel. The narrative is needlessly convoluted. Skarsgård delivers a wooden performance that lacks the emotion necessary for us to invest in Tarzan’s mission to free the Congo. Ultimately, for all it’s basic competence as an actioner, The Legend of Tarzan is a forgettable chunk of summer-movie bloat.